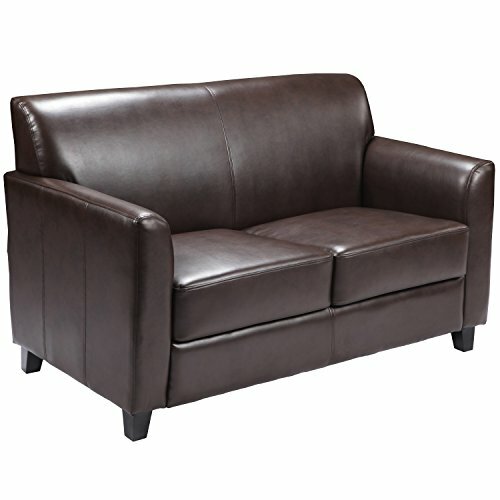 Benville Modern Brown Leather Loveseat features a sturdy hardwood construction with attractive arms and raised wooden feet, plush seat and back upholstered with soft brown leather, cushion seat is sewed-in and non-removable. This loveseat is suitable for any office reception area, waiting room, or to be used in your living room as a seating for two.You can be assured that this loveseat will provide a nice contemporary look to match your decor.Not only will this loveseat fit in a professional environment, but will add a modern look to your home.Features:Type: Loveseat, SofaMaterial: Wood, LeatherStyle: Traditional, Contemporary, ModernAssembly: Assembly RequiredPrint: SolidExact Color: BrownColor: BrownDimensions:Overall: 32.25 Inches High x 52 Inches Wide x 29 Inches DeepSeat Size: 17.5 Inches High x 42 Inches Wide x 19.5 Inches DeepPlease note:Orders of 151 pounds or more will be shipped via Freight carrier and our Oversized Item Delivery/Return policy will apply.Please for more information.Assembly RequiredNote about assembly: Manufacturers often put the furniture legs in the lining underneath the couch. Typically, there's a bag with the assembly materials located near a zipper in the lining. If you have any questions about this product by BSD National Supplies, contact us by completing and submitting the form below. If you are looking for a specif part number, please include it with your message.